"Yesterdays" by Gordon Goodwin's Big Phat Band dazzles with Art Tatum as a virtual soloist. Acclaimed Zenph re-performance to be played live at L.A.'s Hollywood Bowl -- Mrs. Art Tatum to be in the audience. Pianist Art Tatum was once described as "the greatest soloist in jazz history, regardless of instrument." He passed away at age 47 in 1956, cutting short his legendary career. Now, imagine being able to collaborate with Tatum today - to have him as the front man for your big band in new arrangements and recordings. This was the dream of band¬leader Gordon Goodwin, realized in an arrangement with his big band in their album, Act Your Age. On August 26, 2009, we accomplish another dream for jazz fans when Art Tatum joins Gordon Goodwin and the Big Phat Band on stage at The Hollywood Bowl as a featured soloist playing Jerome Kerns' "Yesterdays," using the GRAMMY-nominated original arrangement written by Gordon Goodwin. In the audience will be Mrs. Art Tatum. Geraldine married Art in November 1955, but he passed away one year and ten days later. This is an historic event for Zenph Studios and Gordon Goodwin, the first time a Zenph virtual artist has played live with a big band or ensemble. It underscores the genius of Gordon Goodwin's arrangement and the extraordinary quality of Zenph's re-performance technology by capturing Tatum's artistry perfectly. Zenph's unique process turns audio recordings into virtual artists, whose re-performances® precisely replicate their playing in the origi¬nal recordings. Zenph captures their musical nuances, with details about the pedal actions, volume, and articulations in micro-second timings. This new data is played back on a state-of-the-art Yamaha Disklavier Pro concert grand piano. The process results in the production of pristine new renderings that transcend the limitations of the original recording process. "Yesterdays" was nominated for the Best Instrumental Arrangement, and the entire Act Your Age album was nominated in the Best Large Jazz Ensemble Album category. 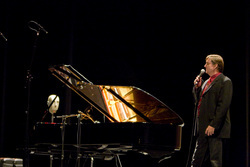 Zenph founder and president, Dr. John Q. Walker, said of these nominations: "The artistic genius of Art Tatum, so exceptionally re-performed on Sony's' Piano Starts Here' album, has given rise to a new creative work - brilliantly composed, arranged, and performed by Gordon Goodwin and the Big Phat Band. This was our first collaboration, and having two GRAMMY nominations to confirm the excellence of our process is wonderful. Zenph Studios is thrilled by the musicality of these performances - separated by time, but united by our technology. We think this performance at The Hollywood Bowl is a wonderful capstone to our collaboration with Gordon and the Band"
Zenph's solo album of Tatum was released by Sony Masterworks in June 2008 and was enthusiastically received by the critics. "This is a crucially important release in musical history," wrote Stereophile magazine. Gary Giddins, in JazzTimes, said "it blew my socks off." JazzReview.com observed "If you buy only one solo jazz piano recording this (or any) year, make it Piano Starts Here." Zenph's work was named one of the "Best Ideas of the Year" by The New York Times Magazine and has been featured in The Wall Street Journal, The Los Angeles Times, The Washington Post, Stereophile, The Absolute Sound, National Public Radio, the CBC, and the BBC. And, Gordon Goodwin and the GRAMMY committee agree: the Art Tatum re-performance swings! Art Tatum in re-performance, playing "Yesterdays" "Act Your Age" by Gordon Goodwin's Big Phat BandArt Tatum in re-performance, playing "Yesterdays"